"Create the CHANGE you seek in the World. Thrive in the honey bee ECOnomy." Both for profit and non-profit businesses are led by ecopreneurs who are making the world a better place through their creative, innovative and ground-breaking enterprises. 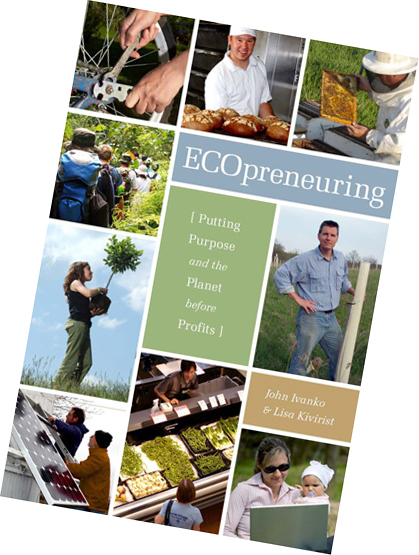 ECOpreneuring features numerous Ecopreneur Profiles along with many other brief summaries, but there are millions of ecopreneurial enterprises prospering throughout the U.S. and around the world. We're always amazed by the creative and innovative spirit of ecopreneurs throughout the world. Join others on our Facebook page and connect with other enterprising ecopreneurs who are changing the world for the better through the businesses they create. Order your copy of ECOpreneuring today at a 22% discount off list price (a PDF file order form).